The Personalized Family Bible designed to be a treasured place to record your legacy alongside the Word that inspired it. Under the “This Bible Belongs to:” on the front page, the Bible will read, “In honor of”. Please choose which occasion you are celebrating. If you do not see your occasion, please contact me at contactus@move-the-mountains.com after you check out. Please allow for a window of 2 business days for a reply. Please type the name or initials as you want them exactly. What is the date of the occasion you are celebrating? Please choose which font fits your occasion. 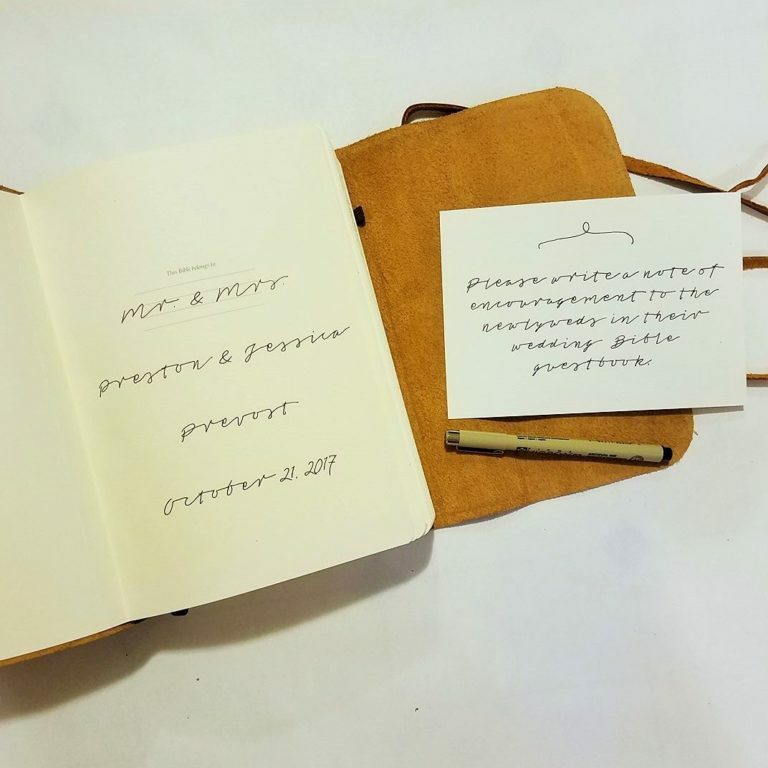 I understand that the name will appear exactly as I have typed it and will vary slightly from the font style due to the nature of it being hand lettered. Record your legacy in a sacred place. The Personalized Family Bible is meant to be a life-long journal where you document your walk of faith for yourself, or your children and grandchildren. It is designed to be a timeless family heirloom Bible. 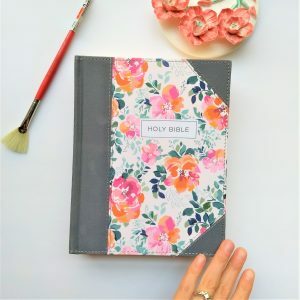 This a personalized ESV Bible with interleaved pages to record your journey and can be customize to fit any occasion for gifting (wedding, retirement, birthday). What is the Personalized Family Bible? 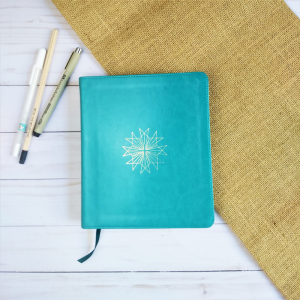 Because this is an interleaved journaling Bible, it features a blank page alongside every page of Scripture so that you can capture the legacy of your life. The pages are there for personal reflection, prayers, art journaling, and more. Also, the personalized leather Bible arrives in a beautiful white gift box with a bow. Additionally, there is a blank tag and a postcard inside explaining the significance behind your gift. The postcard explains how the Personalized Family Bible celebrates the recipient’s life and how the blank pages are there to capture their musings on Scripture. Also, it can capture their heartfelt prayers and artistic expression. 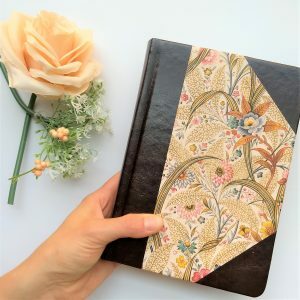 It is not just a Bible for note taking or doodling, it is designed to be an extension of their very souls and an imparting of experiential wisdom. It is there to preserve their legacy. This gift Bible comes in the trusted translation of the English Standard Version so you can study Scripture with the peace of mind knowing that you are reading the inspired Word of God. Another wonderful feature of this Bible is that it contains the “Through the Bible in a Year” reading plan. This can encourage you to begin the recording of your legacy with structure. 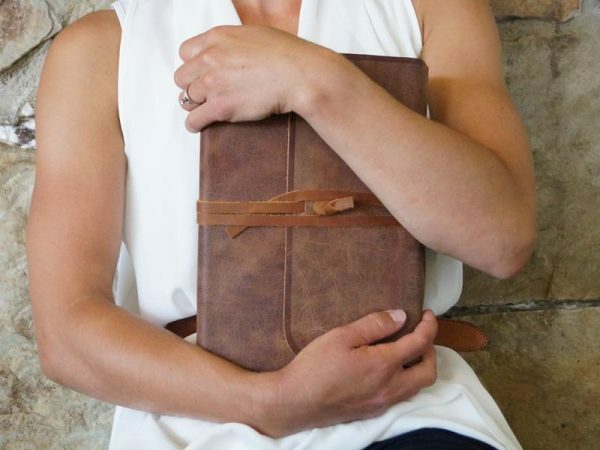 Finally, this personalized leather Bible is designed to be passed down from generation to generation. 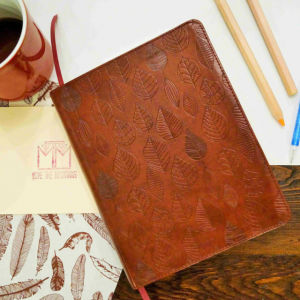 It features a durable Smyth-sewn binding, high-quality cream color pages, and is natural leather to make sure it lasts for generations. 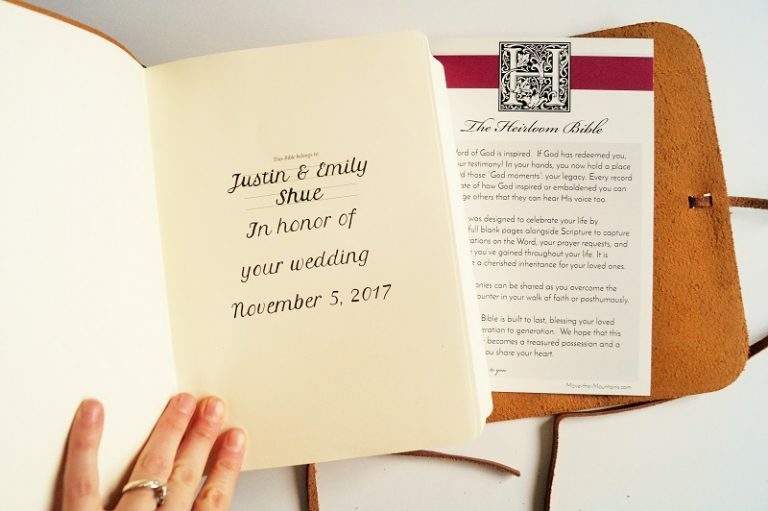 If you are looking for a personalized journaling Bible more catered to weddings, click here to see our line of wedding Bibles! 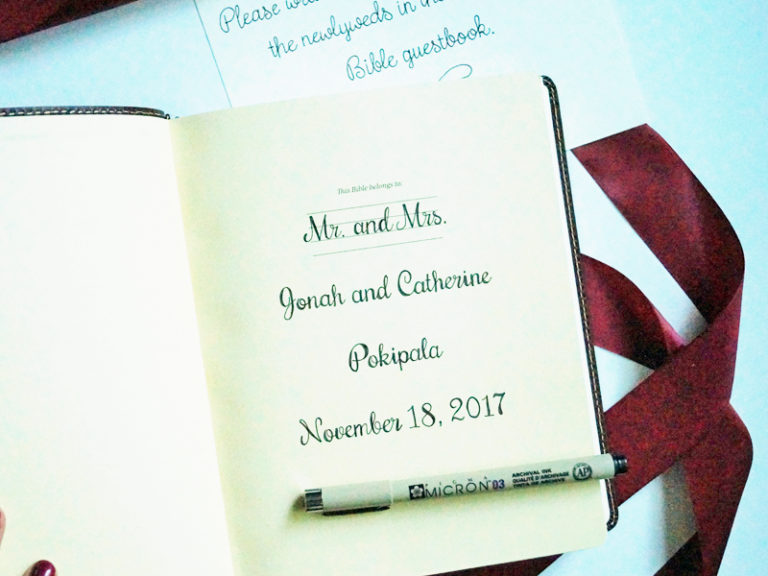 What is included in the Personalized Family Bible package? 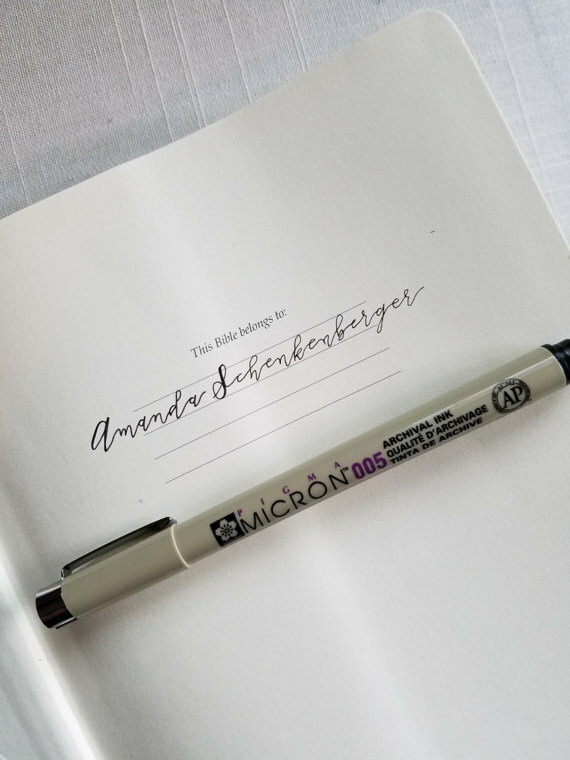 Please feel free to contact Amanda to see a preview of your desired font with personalization. 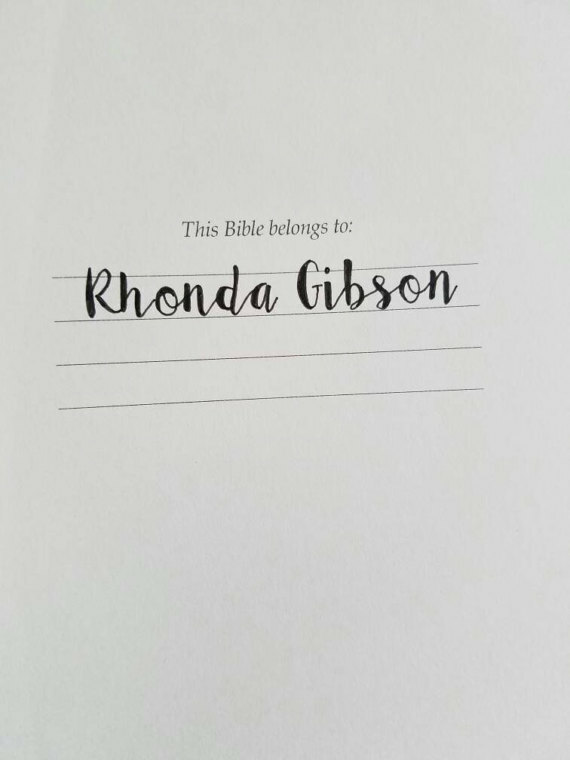 Click here to contact me about previewing the font of your personalized leather Bible.